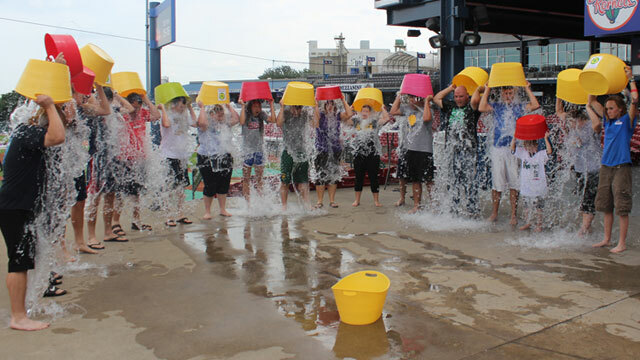 Cedar Rapids, IA - Kernels players and members of the Kernels front office staff will take the Ice Bucket Challenge for ALS Awareness on Wednesday, August 2nd at 2:30 PM on the main concourse at Perfect Game Field right inside the main gates. In 2014 the Facebook and other social media pages were filled with people accepting and fulfilling the Ice Bucket Challenge. The moto now of the ALS Association is "Every August until a Cure". The Kernels staff and players are also making a cash donation to the ALS Association as a group. The purpose of the challenge is to accept the challenge and pour a bucket of ice water over your head, make a donation to ALS or both. Donations can be made by visiting the ALS website at www.alsiowa.org. The Kernels continue a seven-game home stand tonight at 6:35 PM vs. Clinton. Gates open at 5:30 PM and the current home stand continues through Friday, August 4th.